Richmond has snared gun West Australian midfielder, Reece Conca, with its first selection in the 2010 AFL National Draft. The Tigers’ Recruitment Manager, Francis Jackson, had no hesitation in reading out Conca’s name at tonight’s (Thursday, November 18) Draft, held on the Gold Coast. Conca had been penciled in by the Tigers as their No. 1 Draft choice for several months. The 18-year-old, from WAFL club Perth, had thoroughly convinced Tiger talent scouts he was their man at the No. 6 selection overall in the Draft, due to his excellent all-round football skills, versatility, and impressive leadership qualities. In 2010, Conca was vice-captain of the WA team at the under-18 National Championships, and he was considered unlucky not to be named as an All-Australian. At WAFL level, he worked his way up from Perth’s colts team to senior ranks late in the season and had an immediate impact, highlighted by a best-on-ground performance in just his fifth game, against ladder leader Claremont. “We’ve been very keen on Reece since Round 1 of the WAFL this year. I saw him (in the colts) against East Fremantle, where he had 35 touches and dominated,” Jackson said. “All-up, he played only seven colts games this year, one in which he was injured, yet still managed to finish equal sixth in the competition’s Jack Clarke Medal, after six best-on-ground performances. “He’s just such a well-rounded player. He’s got high endurance, really good speed and outstanding lateral movement and awareness. I’m sure that his peripheral awareness, and understanding of what’s happening around him, is a direct result of him playing soccer up until the age of 13. “Not only does he win a lot of the ball, he’s a very, very good user of it. Out of all the kicking profiles that we’ve done, his is the best. He can take a good mark, his decision-making is outstanding, and his ability to win one-on-one footy, as well as win outside footy, is just a joy to watch. “We’ve tracked his progress closely all year, watched him play live every game, and he doesn’t appear to have any weaknesses. Conca’s intelligence is not merely confined to the football field . . .
“He has been doing a commerce/psychology degree at Trinity College in Perth, but he deferred this semester,” Jackson said. “We gave all our psych tests from the Draft Combine at the end of the season to the Club’s psychologist, Kim Stephens. He didn’t know any of the players - all he had was 30 names, with 30 psych profiles for different tests - and Reece came out No. 1. “So, he’s the complete package . . . an outstanding kid." Jackson had a nervous wait along the way, fearing one of the clubs with selections before Richmond early in the Draft, would take Conca. “He had an ankle injury later in the season and subsequently had a bit of a bone spur removed through surgery, which meant he missed the last two rounds and the Colts finals - but I was more than happy with that,” Jackson said. * Found out Tuesday night that the Tigers were in the mix. * Ready for the challenge of moving to Vic. Mum giving him tips. Enjoying Melbourne. * Want to get stuck into preseason as soon as possible. If can play round 1 it'll be a real buzz. Do what he ever can to make the team. * Models himself and his game on Ryan Griffen. I find Griffen laborious and predictable. Doesn't do enough against the better opposition clubs. Seems to jut his chest out against us alot. I hope Reece has more consistency. Reece is a wonderfully balanced midfielder who is equally adept at winning contested and uncontested ball. He has an excellent work rate with good speed and elite lateral movement. He competes well, has outstanding composure and vision with the ball in his hand and is a very good user by both hand and foot. Reece played seven games at colts level in the early part of the year and dominated to such an extent that he came in the top 6 of the league best and fairest despite his lack of games. He had a strong carnival for WA in a team that failed to beat any of the other three division one teams and was extremely unlucky not to be named as an All-Australian. 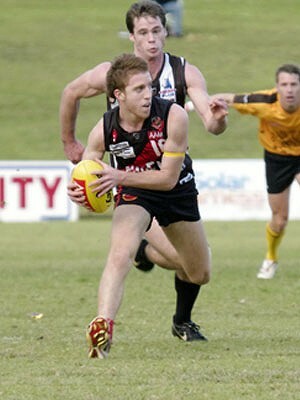 When Reece returned to Perth he was elevated to the senior team and immediately looked comfortable at the higher level. The highlight of his five league games was a 27 possession game (25 effective) against the ladder leaders Claremont in just his second game. The club is extremely excited to have Reece at the club and feel he will add to our ever growing band of quality midfielders as well as having significant impact on the group off the field with his strong leadership qualities. A confident player who works hard on and off the football field. A real team-oriented and leadership figure who enjoys all aspects of football and strives for success. Which AFL player do you feel you resemble and why? Ryan Griffen - because of his ability to run and carry along with the fact he can play multiple positions effectively. He’s an honest and fair player who seems a real leader at his club. What are your strengths as a footballer? I have the versatility to play multiple positions, ability to play inside and outside, good leadership, and the ability to run and carry. What parts of your game would you like to improve? My goal kicking, tackling, and physicality around contests. Which AFL team do you support and how did you come to barrack for them? Sydney Swans - Paul Kelly was and still is my AFL idol and watching him growing up made me support the Swans and inspired my thirst to play AFL. I dont think our problem from this draft will be Conca. It will be whether or not we can find even just 1 player from 30, 47, 51 and 63. Casino stuff tonight at those picks. I hope they come off but if they dont, its over for Jackson and Cameron. You cant do this roulette wheel stuff if your recruiting for Richmond. Anyway, lets see what happens. The vision of the Ruckman is promising. Genes play a huge part in an athlete's chances of success. Gary Ablett has benefitted from the genes passed on to him by a brilliant father and players regularly tell stories about their parents having good sporting careers as youngsters. But for Perth midfielder Reece Conca, much of his success can be attributed to the gene that he avoided rather than the one that his parents passed on. Conca is the exception in his family. His dad Loui, mum Gina, elder brother Luke and twin sister Cassie are all between 160-170cm tall. Yet Reece towers above them at 182cm. Short players rarely get drafted. West Coast defied that process last year by selecting 169cm Claremont forward Ryan Neates and rookie listing his 167cm teammate Lewis Broome, but it's tough to succeed in the AFL when you're restricted by height. "Everyone asks me where I get my height from. I don't really know," Conca said. "It's a bit of a blessing to have the height. Dad and Luke are handy footballers, but it's a lot harder for shorter players." Conca has lived and breathed football for most of his life. Living across the road from a park, he and Luke battled through their own mini-wars after school and on weekends. It became apparent from an early age that Conca had outstanding talent. He played a year above his age group once he turned 13, made his WAFL colts debut as a 15-year-old and represented Western Australia at under-15 and under-16 levels. He is vice-captain of the WA under-18 team and will be a key player in today's match against South Australia at AAMI Stadium. Now studying psychology and commerce at university, Conca captained Trinity College and combined school football with games for his junior club and Perth. In 2008 and 2009, Conca played about 100 games. A hard-running, highly-skilled on-baller who is damaging around stoppages and has a similar style to Bulldog Ryan Griffen, Conca said playing so much football had brought his game to another level. "It's been footy all the time for about four or five years," Conca said. "I played 60 games in 2008 and at least 30 or 40 in every other year. The State team takes priority now so it's just them and Perth colts. "Early on in footy I played a fair bit across half-back. But in the last couple of years I've been an inside midfielder." History: Reece Conca is a versatile player who has good kicking skills. He is of medium height (185cm) and medium weight (79kg), maybe a little bit light but not too bad for a draftee. Reece Conca reads the play pretty well which makes the best use of his running and carrying abilities. It enables his to find the best way to get past players and get a disposal off in time. He can play all over the ground and as such collects pretty good statistics for disposals. Reece Conca had an average of 18 at 79% efficiency at the AFL Under-18 Championships. Conca is a little soft so cannot play an inside midfield role at the moment but that might change with a bit of bulking up after a couple of pre-seasons. Reece Conca was WA’s vice-captain in the U18 Championships where he was very good in their game against South Australia. His trademark is to slide-gather and get up and go in the motion – turns opponents inside out. Only OK to decent pace over distance, but his quick first step and agility buys him time and can get him out of tricky situations. Footskills are sound – generally neat and reliable over short range, but perhaps lacks a bit of depth/penetration over longer distances. Conca is a player that’s grown on me the whole season - I confident he will be a good to very good versatile small midfield/utility (can play a number of midfield roles including inside, tagger, play-linker, as a small defender or defensive small forward) that has the potential to be a high end B grade player. Will play AFL next year and quite possibly quite a decent amount (more than 10 games), due to his previous senior experience, work-rate and versatility but probably needs another 7-10kg to reach his ideal AFL weight which will take about 3-4 pre-seasons. Profile : Really like this kid but a bit unsure where he lands principally because he doesn’t have a heap of standout features. Notwithstanding, you have a kid that has had a super Colts year and has played some really good state league footy (5 games incl a BOG vs Claremont). Backed that all up with a series of good performances at the Champs where he averaged 18-20 touches at a whopping 80% efficiency and hence I think will go higher than most think. Would describe him just as a very smart footy player who can play anywhere over the park. Good overhead, skills better than what you probably think but it’s how he finds space, the second efforts, chasing and tackling which mark him as a determined young footballer who will definitely go pretty well with his AFL career. The knock I think is these blokes often go a bit later because there is no obvious x factor but plenty of his type have proven recruiters wrong over last few years .FWIW – this kid is no dill either as he is doing a double degree (phys and commerce)! I have Conca well down the list compared to some because I struggle to see where he is going to play in the AFL. He will probably be sold as a half back but he is not a great defensive player and on the rebound he is pretty good but nothing to write home about. He has a lot of reasonable skills but nothing about him demands “pick me”. What he has done to date is be able to continue to step up and continue to get the ball and influence the game as he has progressed through leagues. He had a very solid Champs for an average WA team averaging 18 possessions a game and when he got the chance in the WAFL at the end of the year he continued to progress and picked up 19 disposals a game. He has mid range pace and mid range athleticism all around. So not slow but not particularly quick either. When he is in the midfield he plays as an outside in player who occasionally will win a clearance but plays mostly as a receiver. Probably his best skill is his ability to find space. He has a great sense of where to go to receive uncontested ball no matter where on the park he is playing. He needs to improve his endurance to take full advantage of this and if he can he could be a good ball winner at AFL level. He gets quite a lot of marks (5 per game at the Champs) but this is usually because he gets to space so well rather than because he is a good mark of the ball. That is not to say he is a poor mark but I think he is not up there with the better marks in the draft and he does drop a few he should take. His kicking is solid and it probably tends to look better than it is because he takes his time and takes good options. He is very right footed and the need to get onto his right can sometimes get him into trouble. He gets to space well and this gives him time to evaluate the situation and not be rushed. The determination not to be rushed does often tend to see him slow down the play too much which is not going to fly well in the AFL where that often allows defences to reset and makes things difficult. As mentioned he takes quite a lot of marks but when he takes his marks he invariably stops and props and if he doesn’t go back over the mark he certainly slows things down. He rarely just takes the mark and takes off. He does not have a forward mentality and if he gets the ball inside 50 his first instinct is to pass off. Add to that that he is a relatively poor tackler who does not work hard enough defensively and I think he has a way to go before he will be playing AFL football unless it is for a team looking to blood their young players early. I see him as a leader and he was one of the more vocal players in the WA team. He could be seen getting in there and trying to rev up his players at the breaks at the Champs. Overall I see him as someone who could go anywhere between 20 and 50. He does not have a lot of weapons but I am sure someone will see something they like. eugh, i think like a lot of people i only have highlights to judge him off, but i really like his ability grab the loose ball. There is actually a bit to like about him, seems to find options with ease. very instinctive about his disposal. i can see the attraction! IF RICHMOND didn't already have the makings of an elite midfield, it does now. I'ts a suggestion that is fraught with danger, given the Tigers' chequered draft history. But the addition of smooth-moving wingman Reece Conca at the national draft last night was a clear statement of intent from the revived Richmond. It wants a superpower centre line. With Dustin Martin, Trent Cotchin, Brett Deledio, three first-round draft choices, plus Nathan Foley, it might have it. Conca, who was told on Tuesday he would be snapped up by the yellow and black, said the club had grand plans. "They would like me to slot in and complement those guys in the midfield, which would just be great," Conca said. "Thats the focus at Richmond, to build that midfield. "We've got Jack Rielwoldt in the forward line and some really good young players. "Cotchin and Martin managed to play some games in their first years and be quite successful and if I could follow in their foot steps in that regard I'd be over the moon." But there was a hiccup. Yesterday morning a hacker uploaded a profile of Conca and linked to Richmond's website. While it was a touch embarrassing for the club, it was something of a nice surprise for its latest star draft choice. "It was only about half an hour before the drafted started, I was pretty excited to have that come up because it gave me a little bit of time to know you were definitely going to the club, he said. "It took a little bit of the nerves out of it." Conca, who was a dominant player for Western Australia at the recent national championships, is far from an outside-only player. He prides himself on his tough work in tight and strength over the ball. And his efficiency by foot is a lethal asset. But the No.6 draft choice has not been kind in recent years. Talent guru Kevin Sheehan rated pick six a tricky one, saying the best player picked with it in draft history was the relatively unknown Fremantle player James Walker. Some would say the number has been "cursed", in a tongue-in-cheek way. Conca is hoping to change the pattern. "I have heard a little bit about that, I'm just glad to be going somewhere," he said. "My good friend David Myers went same number, same local club as well, Vic Park. "Im just stoked to go top-10 let alone number six. If I can break that trend ill be happy."